Freeze sirloin steak for 20 minutes until it’s very cold, then slice as thin as possible. 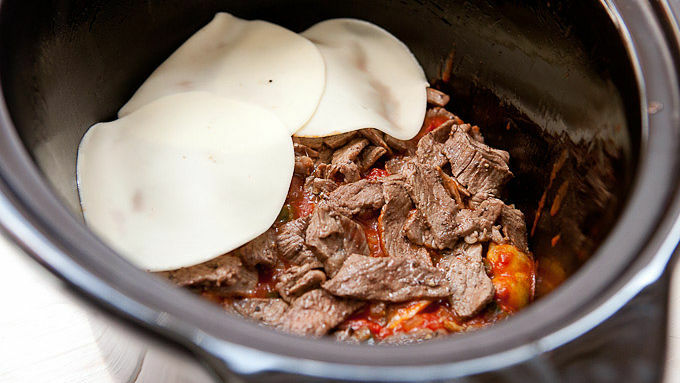 In a large skillet add a drizzle of oil and the steak slices. Brown steak well for 3-4 minutes. Season with salt and pepper. 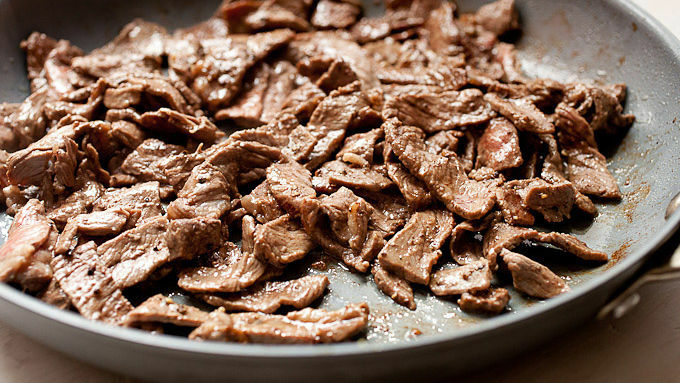 Remove steak from skillet and add a new drizzle of oil. Add onions, mushrooms, poblano pepper, and garlic and cook until veggies soften, 5-6 minutes. Season with salt and pepper and add tomato sauce. Cook for a few minutes so sauce can meld with veggies. Add red pepper flakes. 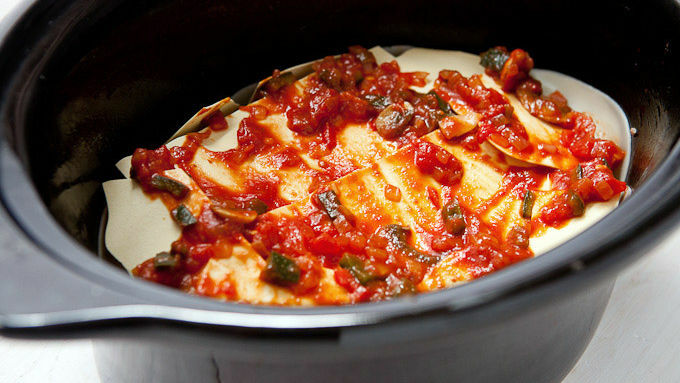 In a 5 to 6-quart slow cooker, add a small layer of the tomato mixture to the bottom of the dish, then add a layer of no-cook lasagna noodles (it’s okay if you have to break them up a bit to get them to fit). Then add half of the steak, half of the Provolone slices, and half of the mushroom and pepper mixture. Top with another layer of noodles, the rest of the steak, the last of the Provolone, and tomato sauce mixture, leaving some of the tomato sauce mixture for the top. Add a top layer of noodles, followed by the last of the sauce, covering the noodles as best you can. Cover and cook on high heat in the slow cooker for 3-4 hours until it’s bubbly and starting to brown around the edges. Serve lasagna drizzled with warm cheese sauce (optional). 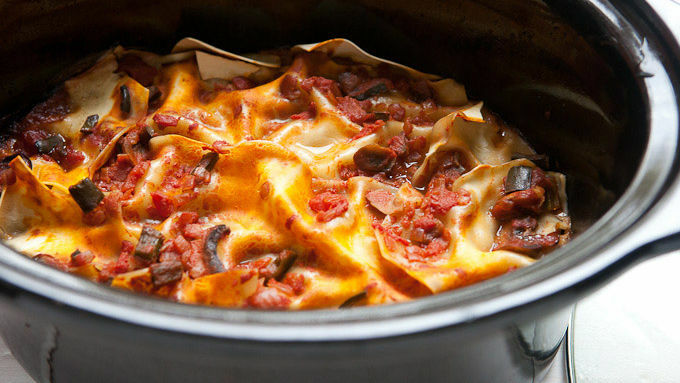 This is SO not your mom's lasagna... If you’ve ever been lucky enough to travel to Philadelphia and enjoy a traditional Philly cheesesteak sandwich, you know there are a few options. You can get the sandwich with onions, with provolone, or with cheese sauce. 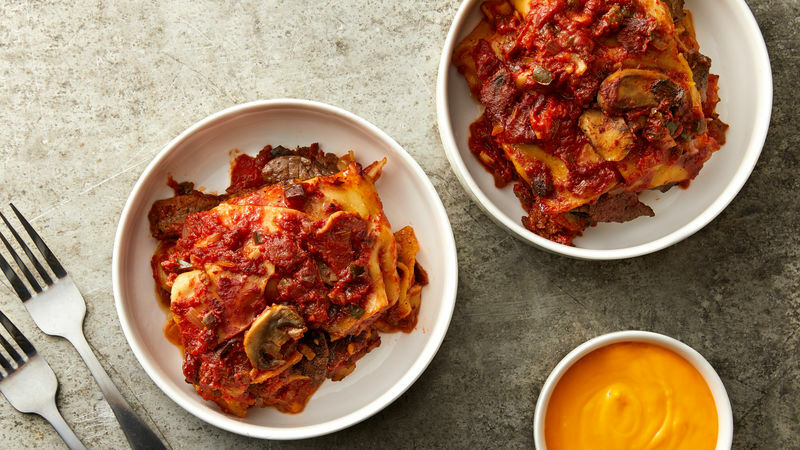 I always opt for the onions and cheese sauce, but when I’m at home (and especially if I’m layering all the delicious ingredients in a lasagna like this one that I had to try for myself, I just choose all of the above – plus, I add some mushrooms and peppers for good measure. Of course, the base of it all is good steak. Start with a good piece of sirloin steak and freeze it for 20 minutes so it’s really cold. That will help you slice it as thin as possible. 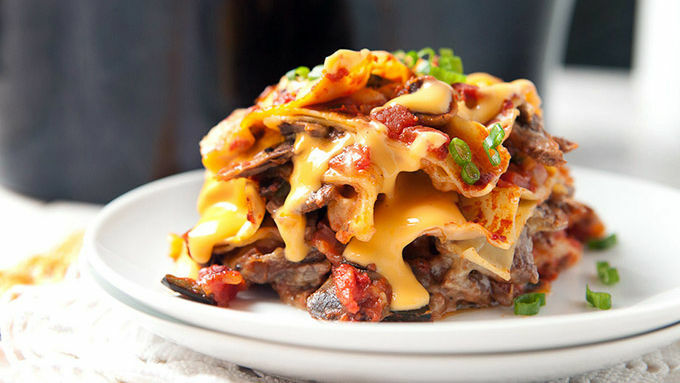 You could serve the finished lasagna as is with great success but if you really want to take it to cheese steak bliss, drizzle each piece of lasagna with warm cheese sauce! Whatever you do, don’t cook the lasagna with the cheese sauce. It’ll totally break down and get gross. 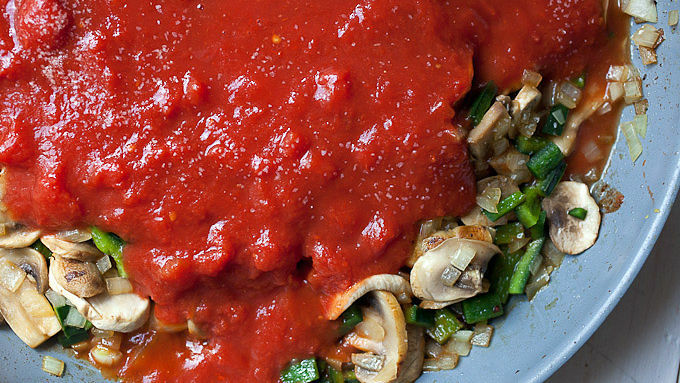 Use it as a finishing sauce and you'll be good to go.